Why can you never be hungry in the desert? Originally uploaded by John D Hardy. 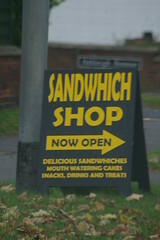 This was seen roadside in West Yorkshire.The shop across the road had the same name plastered across its front, but I was unable to point the camera at the shop as we were moving in heavy traffic at the time. Israel has lost the plot? I don't think so. Like all other Britons under the age of sixty seven, I do not remember my country being involved in war that threatened our lives daily. I do not remember listening for the sound of sirens that would send us scurrying to the bomb shelters or the nearest underground tube station or in the absence of these under the relative safety of the kitchen table. I simply grew up in "Post War" Britain with all the advantages of the newly founded welfare state and free education upto and including post Graduate studies and that was the life I knew. When Harold Wilson said "you have never had it so good" for people from my background at that time he was speaking the truth. Having said that I grew up in a world where the reminders of World War 11 were all around. There was a cased set of books in my mothers bookcase,full of wartime pictures some totally shocking and some for a child difficult to interpret.There were two small brown taped up boxes in the bureau, one with two medals and one with seven, all with bright shiny colourful ribbons. It was only as an adult that I learned that the air raid shelters were there as a protection against blast and they were there because it was easier to dig out a family trapped in a shelter than a family trapped in the wreckage of a house.There would have been no protection from a direct hit. All this I heard and took in but it was from the memories of the trauma of my parents generation and they stuck with the basics of what happened if they talked about it at all and my mother talked about the camaraderie of those sheltering on the underground railway platforms and of the roof top listening that she did as a volunteer in London's East end and the difference between the sounds of British and German planes and of the coming of the V1's and V2's but she spared us the horrors of the raw reactions of terror and it sounded like adventure rather than horror. My father buried his recollections even deeper and rarely spoke of his war, in North Africa, Italy, France, Germany seeing action with Montgomery at El Alamein and on D Day....but after he was dead I heard through one of his sisters that when he came home he went on a six month bender and stayed drunk out of his mind to try and forget.I never knew him like that. and I asked myself who was losing the plot.People do not have "safe rooms" when there is nothing to fear.Sirens are not a part of the daily life of people living in security. What do Hamas expect when the send rockets into Israel.The Israelis have been through too much to expect them to roll over and move out of the land they occupy. If Welsh nats were sending rockets into Birmingham and the Brits of Shropshire needed safe rooms because of the daily threat of bombardment, would we expect our government to stand by and let them carry on regardless of consequences? I rather think not.